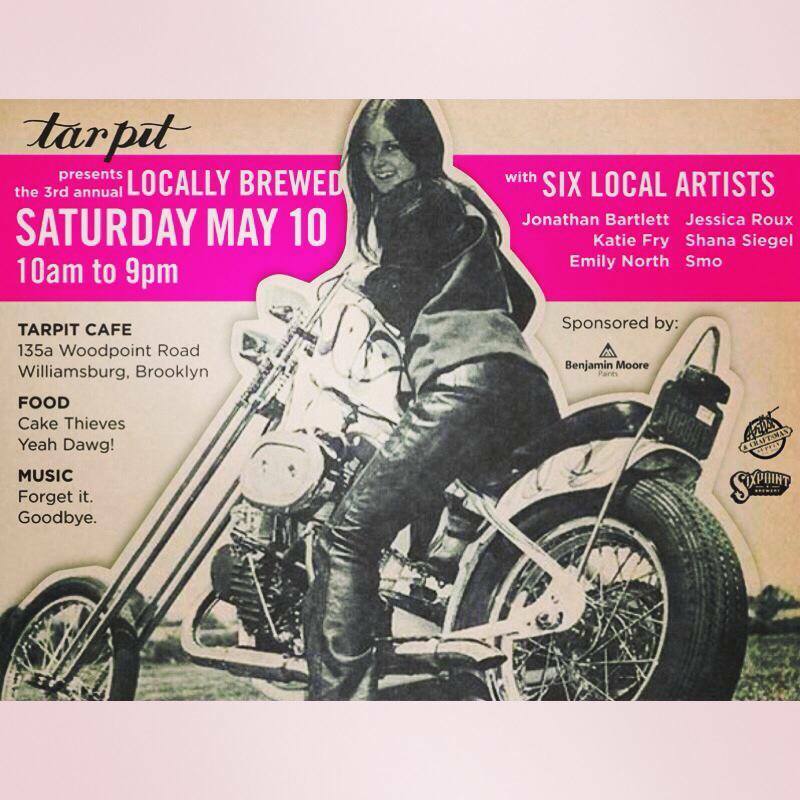 The Miss-Fires are joining forces with the owners of Tar Pit coffee shop for a day of art, food, booze, motorcycles and charity! 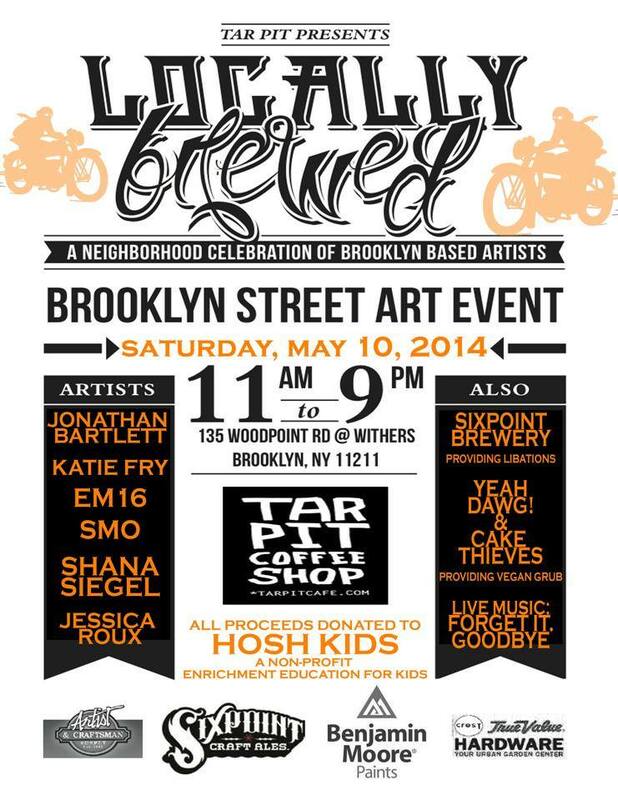 The Tar Pit coffee shop holds its annual event, Locally Brewed, next Saturday, May 10th from 11am-9pm. The event hopes to cultivate new relationships within the community by introducing local artists and making their art more accessible for the general passerby. They also hope that it inspires communication within the neighborhood fostering new friendships and continuing existing ones. The six selected artists have been given a predetermined theme a few weeks in advance and work within a selected color palette. Functioning raised panel garage doors serve as the canvas. The artists will be placed in a sequential order and will complete their paintings as a live performance. This year’s theme is MOTORCYCLES! There will be food by Yeah Dawg! and Cake Thieves. Sixpoints is getting some brewski. There will also be a band or two. The Miss-Fires will be on hand to help raise money for a local charity: Hosh Kids – Hosh is a local yoga studio that sends its teachers to local schools to provide children with sessions of yoga and meditation. During these sessions they also teach very important lessons on mindfulness. The owner said that if we could raise $800, that it would be enough to provide one local school with one semester of practice. We’ll be having a bake sale (cookies in the shapes of tools! Yes! ), a 50/50 raffle and a regular raffle with gift certificates from local restaurants, hair salons, tattoo shops and other establishments. Other great raffle prizes include lots of moto related items including some gear graciously donated by Val of Motorgrrl Garage and moto accessories from Corinna at Via Meccancia. This could be your chance to get on the guest list for a Bowery show or snag some gear that you’ve been meaning to purchase. You might even walk away with a great gift for mom (Mother’s day is Sunday!). We’ll make room for Moto parking! We welcome respectful bikers of all stripes. This entry was posted in Charity, Gatherings. Bookmark the permalink.